At the end of the 1520s, at the time of the siege that brought to an end the last Florentine Republic (1529–1530), the painter Jacopo da Pontormo, (1494–1557) created one of his most moving and groundbreaking paintings, the altarpiece of the Visitation. The recent restoration of this masterpiece of Mannerist art has created the extraordinary opportunity for the work to travel for the first time from Carmignano (near Florence in Italy) to the United States. Pontormo: Miraculous Encounters presents Pontormo’s spectacular altarpiece together with its preparatory drawing and with another masterpiece by the artist, the Portrait of a Young Man in a Red Cap (Carlo Neroni?). Pontormo painted this portrait of the handsome yet enigmatic young man during the same dramatic months of the siege of Florence. Believed to be lost, it has only been recently rediscovered in a private collection in Europe. This exhibition is made possible with lead funding from an anonymous donor in memory of Melvin R. Seiden and generous support from Mr. and Mrs. J. Tomilson Hill and Mr. and Mrs. Lawrence R. Ricciardi. Additional support towards the restoration of the parish church of San Michele and former Franciscan friary of Carmignano is provided by the Foundation for Italian Art and Culture (FIAC). 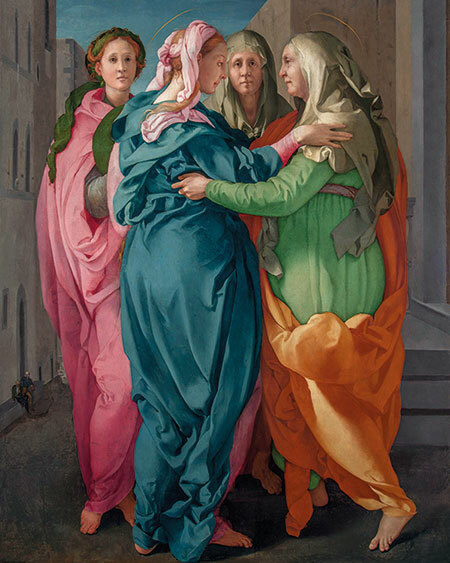 Jacopo da Pontormo (1494–1556), Visitation, 1528–1529, oil on panel, Parrocchia dei Santi Michele e Francesco, Carmignano. Photography by Antonio Quattrone.